2555 Tamiami Trl N #208, Naples, FL.| MLS# 219019279 | Southwest Florida Residential Real Estate for Sale. Rarely Available - Located in the Moorings this unit is well appointed, with custom cabinets and is offered fully furnished with the kitchenette offering a full-size refrigerator, microwave, stainless sink and Granite countertops. 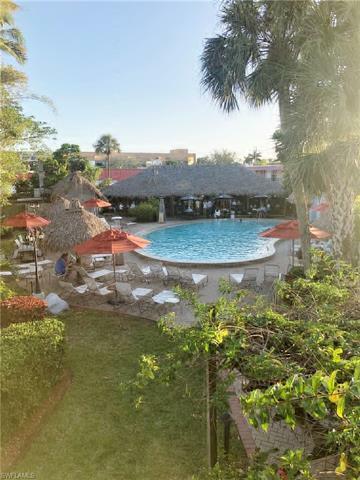 Enjoy your days lounging by the heated pool, grabbing a drink at the tiki bar or dine at two on site restaurants. When you venture out you will find that this unit is conveniently to both beaches and shopping with just a short drive to 5th Avenue, Venetian Village and Waterside shops. The monthly fee includes electricity, water, cable, internet wi-fi access, grounds maintenance and use of the hotel amenities. Housekeeping, laundry service, security and engineering also available. This unit can be included in the ârental poolâ to generate income or for your private use. Cash offers desired as this is a CONDO HOTEL and financing may be a challenge. Vacant and easy to show - Call today!